Rise of the Planet of the Apes is yet another installment in the Planet of the Apes franchise. 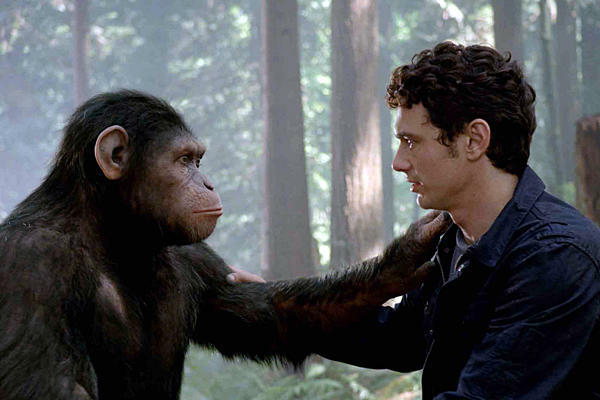 Directed by Rupert Wyatt, it stars James Franco, Andy Serkis, John Lithgow, and Freida Pinto. Franco is Will Rodman, a San Francisco based scientist attempting to cure Alzheimer’s Disease, which afflicts his father Charles (Lithgow). He is testing a genetically engineered retrovirus on chimpanzees and believes he has found a cure when the gene mutates, giving the chimps human level intelligence. But the study is effectively ended when a female chimp goes on a violent rampage to protect her baby and is killed. Caesar attacks a neighbor while defending a confused Charles and he is sent to an ape sanctuary that is run by Draco Malfoy (er, Tom Felton). Caesar struggles to adjust to the ape world and he feels abandoned by the humans. All of this sets into motion what the title tells us will happen: the rise of the planet of the apes. The apes escape from the sanctuary, the research lab, and the zoo leading to a full out epic battle between apes and humans that ends on the Golden Gate Bridge. The plot is all fine and dandy but it is ultimately only half-engaging. Though the final battle is absolutely worth the price of admission, try not to question other aspects like the purpose of Freida Pinto’s character (she’s Will’s girlfriend and is great at making a distraction in a pinch!) too much. The plot really doesn’t matter because Rise of the Planet of the Apes is strictly a technological production. The film takes the motion capture CGI technology seen in The Lord of the Rings and Avatar and puts it fully on display, allowing motion capture to be used on location for the first time. The real highlight of the movie is Andy Serkis, who adds Caesar to his already impressive resume of non-human characters he has brought to the screen. Caesar primarily exists through facial expressions and gestures throughout the majority the film. Serkis morphs himself into Caesar, fully inhabiting the ape and giving him raw human emotions that define and, at times, limit Caesar. 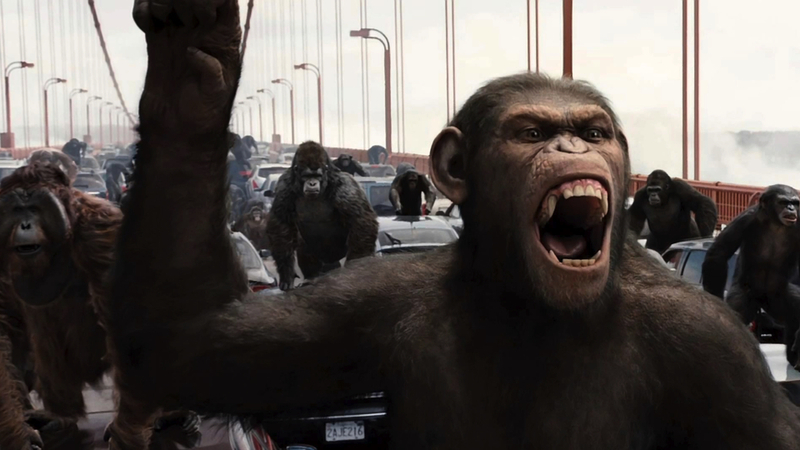 All of this gets at one thing: Rise of the Planet of the Apes is all about Caeser. From the technology used to create Caesar to the actor portraying him to the character himself. The humans, however, have little bearing on the movie, except for what seems to be their inability to do anything effectively, appropriately, or ethically. But their stupidity does leave room for a definite sequel, so I suppose we, and not the damn dirty apes, win out in the end.